Whatever your outdoor event, there will be a tent that matches your needs perfectly. This article describes the main types of tents and events they may be best for. Whatever your outdoor event, tent choice should be one of your first considerations. Here at Main Attractions we have a range of tents available for all occasions, all weathers, and all terrains. These include frame, high peak, tension, clearspan tents and canopy tents. This article discusses the different types of outdoor event tents, and when you might use them. Perhaps the most versatile of all outdoor event tents, pole tents can be used for all events and all occasions. They come in a wide variety of sizes. With high peaks, they provide light and airy spaces, ideal for larger events. They’re particularly popular for weddings, charity events, and corporate summer parties. Whether your event is a casual or formal occasion, you’ll find them easy to decorate with fabric, liners, and lighting. It’s also possible to have different sides to match the occasion. Their architectural qualities, high peaks and sweeping slopes, present a stunning backdrop to any occasion. On the downside, they have to be staked. This means a larger footprint is needed than, say, if hiring a clearspan tent. Inside, views can be obstructed by the center poles. Similar to high peak tents, with an elegant profile these tents don’t need staking. They are ideal for level grass locations, though we can also build floors to level the ground. There are various options for sidewalls, including windows or clear. Frame tents are perfect for use on hard surfaces, as they don’t need staking. 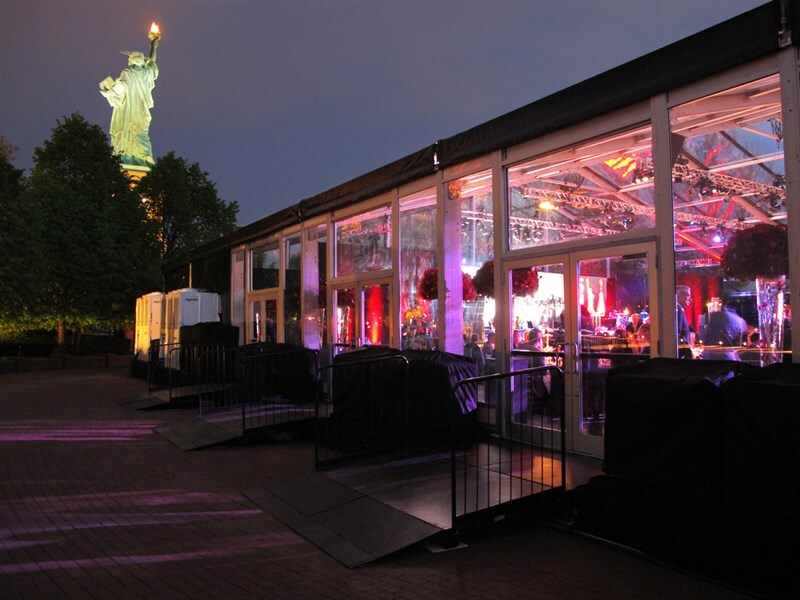 If your event is planned for a patio, concrete, or pavement, this may be the ideal choice. There are no center poles, so views inside are unobstructed. They can be used in conjunction with each other, so it is possible to create different shaped structures, such as a T-shape. Similar to frame tents, clearspan tents have no internal poles. They are extremely rigid, with roof and wall panels sliding into beam channels. The result is a weather-tight enclosure, perfect for longer-term use. They can be built to any length required, with a maximum width of 164 feet. No stake lines are needed. If you’re planning a very large party, a national conference, sales convention or similar, the clearspan may be the best option. Canopies are generally used for smaller events, including trade fairs, community days, backyard barbecues, and carnivals. They are basic tents that provide shelter from sun and light rain. While it is possible to have sidewalls on some canopies, most are lightweight and would not support sidewalls. Contact us today and we’ll help you choose the best tent for your outdoor event.